Autism Blog: Herbie Update: So Far, So Good!! Image: There's Herbie in his home. After a little investigation we confirmed that Herbie is actually a toad rather than a frog. Herbie's home looks a little spotty because my son, C1, decided to "make it snow." My husband and I discovered the hard way that he could reach Herbie's vitamin powder. At least it was harmless compared to scouring powder (with bleach), which could have been chosen to serve as the snow. A stern lecture to C1 seems to have prevented another snowstorm. However, C1, still likes to "make it rain." Herbie needs to have his bedding sprayed down on a regular basis, so "making it rain" is OK as long as he does this in moderation. We have taught our son how to hold the nozzle of the spray bottle upward rather than downward when spraying so that the water will come down more gently if Herbie is out rather than under his log where he sometimes hides for hours at a time. We noticed that Herbie sometimes comes out of hiding when it starts to rain. Herbie seems to like having water sprinkled on his home. My husband and I still take the responsibility of feeding Herbie. 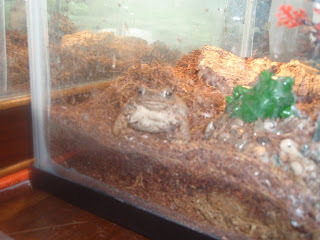 The toad eats crickets and/or blood worms. We let our both of our sons watch. When C1 gets older this may be a responsibility we can trust him to do without consequence. Cleaning the cage (to my dismay) will be my job. Fortunately it's not something that needs to be done a lot and I'm grateful for that! Final thoughts: Caring for Herbie has taken my husband and I out of our comfort zone regarding pets. Before Herbie, the only pets in our home have been cats that have been in our home for a long, long time. So far, though, caring for Herbie is easier than we thought it would be. We also both have admitted to having a soft spot in our hearts for the cute, little toad. Sounds like Herbie is now very much part of the family! How often will he need cleaning out? Or does that depend on how many snowstorms there are?! The pet shop manager said the amount of cleaning of Herbie's home depends on when it starts to smell bad, which should be monthly or bi-monthly, so that is not bad. However, if there is a "snowstorm" or other C1 or C2 inspired disaster then it will be more often.